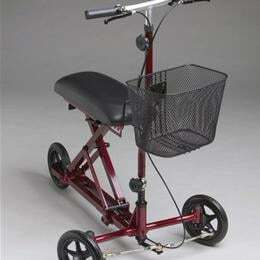 Features and Benefits: Provides a comfortable alternative to crutches and is ideal for below the knee injuries. The three wheel design turns for easy use at home or outside. Equipped with locking hand brakes and a large basket. Adjustable bench accommodates heights 4'10" to 6'4".